*Legendary singer and high-heel wearing performer Prince put his beloved gold guitar up for auction recently and received a $100,000 bid from Lewis Hamilton, the racecar driver. 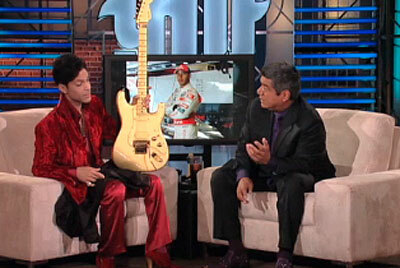 On “Lopez Tonight,” he gave a last glimpse of the guitar to the world and thanked the driver for his charity. The guitar’s donations will go to help fund art, education and environmental projects for Harlem Children’s Zone in New York. In other news, the singer’s line of performances at Inglewood’s (Calif.) Forum for 21-nights of his classics and new music kicked off last week.